In this article, you’ll find tips on how to create wall and floor finishes like in this bathroom. Start in Walls mode and draw the walls of your bathroom. Switch to Materials mode, open a Wallpaper category or use the Magnifying Glass to search for Wallpaper, and add your favorite to the walls. 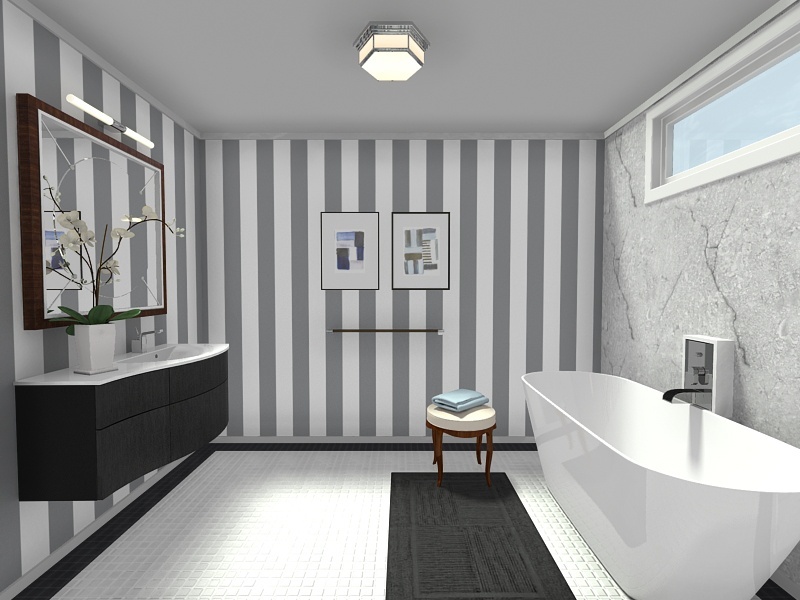 In this example, we added a gray and white striped wallpaper (in the next section, we will change one wall to a different material). While in Materials mode, open the Tiles category or use the Magnifying Glass to search for Tile, and add your favorite to the floor. In this example, we added a white mosaic tile. In the example above, we added a different wall finish behind the tub. Use this method to create stone and tile surrounds at a shower or tub. Switch to Walls mode, and click on the wall you want to change the finish on. You will see that it has a Side A and a Side B. Note which side you want to apply the new finish to and on the right, click Material Side A or Material Side B. In the Select Material page, search for the type of wall finish you would like. In this example, we added a white marble. Click on it to select it and click Apply to add it to the wall. To do this, you will create a zone within a zone using the Divider tool. In Walls mode, click the Draw Divider Lines button and draw a border around the room. This creates a new zone. You now have a central zone and a perimeter zone. Switch to Materials mode and use the Magnifying Glass to search for Tile. Click to select a tile, and click to place it, or drag and drop the tile you would like into each zone. When asked, choose to place it on the Floor. For this pattern, we added the white mosaic tile to the center and a black tile to the perimeter. In Furniture mode, search for your bathtub - in this example we have used Svedberg’s Oval 170 Freestanding Tub (search for Tub Oval to find the product). Drag it somewhere onto the floor plan. Add a vanity and mirror using the same method - in this example, we have used Svedberg’s Joy Vanity (still in Furniture mode, search Vanity Joy to find the product) and the Lewis Mirror from Ethan Allen (search Mirror Lewis to find the product). Above the vanity, we used the Padova 0650 wall mounted lamp from Astro Lighting (search Bathroom Light Astro). In this case, we customized the size of the light fixture by changing the width to 24” in its Properties on the right. This is a great way to determine what size fixture will look best in your design. Take a snapshot to make sure it looks good. Then decorate your bathroom with plants, pictures, and accessories for that final touch!